Recently, especially in light of new targets and expectations, schools have been accused of having narrow curriculums, choosing to focus on core subject development ( the subjects the school is judged on). Forest School offers an ideal opportunity to take a holistic view of the development of children and adults. 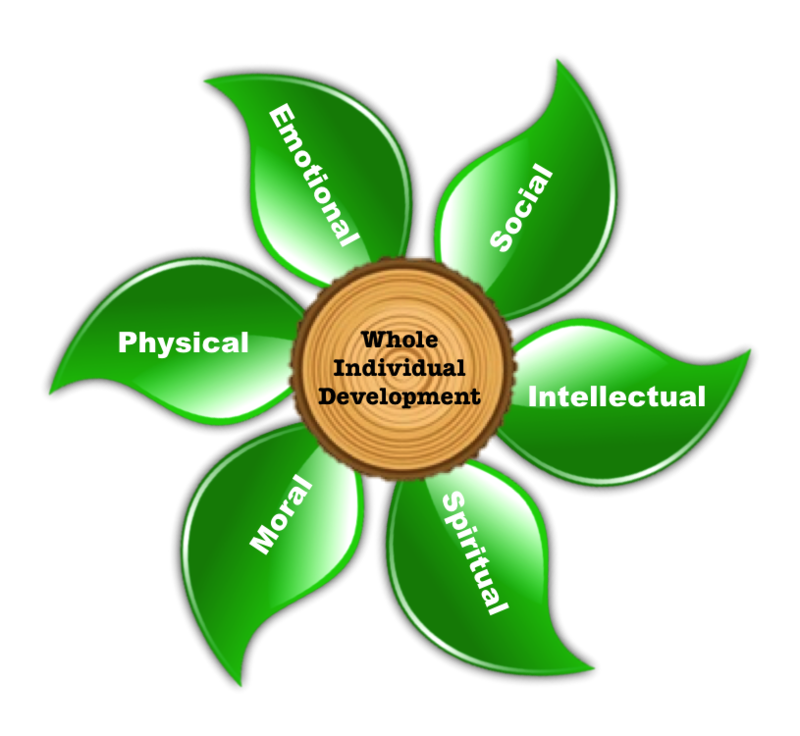 Essentially, by holistic we mean the whole of an individual, focusing on how we develop every aspect not just one. e.g. just literacy. Before we start looking at the whole child/adult we need to have a basic understanding of the different aspects that create the whole. The diagram below shows a summary of these different potentials that make up the whole. Click on the diagram for a printable version with more detail about each area of development. Moving activities – moving through the woods, climbing trees, balancing on logs, moving items between locations. Just experiencing the woodland environment can help develop physical senses. Setting tasks that require perseverance and resilience through having another go. A prime example for this is lighting fires. Enhance calmness through not pressuring time restraints. Setting actives that give a sense of achievement when finished: fire lighting, building a shelter, woodland craft. Many woodland activities incorporate working as a group: shelter building, collecting fire wood, building woodland crafts. Again working in groups: shelter building, collecting fire wood, building woodland crafts. Introduce an element of discussion to allow clients to talk about the task and the best way to complete it. Creative activities: making art using the natural materials around them. Give them a specific objective for the art. Encouraging reflection following an activity, discussing what we achieved and learnt. Playing different games and then allowing children to develop their own. Children will have to develop rules that are fair and just. Respect and love for the woodland. Teach how to care and protect the woodland, considering the long term impact for future generations. A chance for quiet meditation. Mini villages: I enjoy this activity and find it an excellent way to start a series of sessions. It provides an opportunity to address a number of elements related to holistic development. You can adapt the related the story to suite the group, leaning towards emotional, moral and spiritual elements. The building of the village helps develop physical, social and intellectual elements. The reflection element provides another opportunity for emotional, moral and spiritual elements. Woodland Arrival: I have also found that allowing a group to set up camp on arrival can access a variety of this elements to holistic development. Independently the group can work as a team, divide activities, complete physical activities and review their performance at the end, allowing you to see holistic development at its best. You have to be careful with this activity if an alpha child becomes to over powering, you may wish to intervene and discuss leadership skills with this child.